Lasagna is definite a great dish to enjoy all year, but even more during the cooler months. I've made lasagna a few different ways and I'm always in search of new recipes. This Meatball Lasagna was meaty, hearty and really comforting, especially for the chilly nights we've been having here lately. Filled with homemade meatballs, italian sausage and cheese, this recipe is sure to be a family favorite! Lasagna is one of those comforting dishes I really like making. It allows me to use random things I have, bake it with pasta and cheese and enjoy it for a couple of days so flavors can meld. This recipe originally called for fresh pasta sheets but I used oven ready pasta instead. Homemade meatballs are made and used in the recipe but you can certainly use frozen meatballs out of convenience. Italian sausage links are broiled and thinly sliced and also used in the recipe but you can use ready to serve Italian sausage and slice to save some time too. Three kinds of cheeses make this lasagna delicious as well. Pecorino Romano, mozzarella and ricotta are all used, each having their own cheese layer within the dish. Sounds rich and hearty right? It sure is and it's even better the next day (if it lasts that long)! Place breadcrumbs in a small bowl. Drizzle the milk over and let stand until absorbed. Heat 2 tablespoons oil in a large skillet over medium-high heat. Add the onion and garlic; cook until translucent, about 3 minutes. Set aside. Place the ground meats in a large bowl. Add breadcrumb mixture to meats along with the reserved onion and garlic, whole eggs, yolks, parsley, oregano, and cheese. Season with salt and pepper. Using your hands, mix until just combined. repeat 3 more times. Line strips next to one another; sprinkle with breadcrumbs. Cut strips into 1-inch lengths. Repeat process with remaining meat mixture. Working in batches, transfer 1-inch pieces to a large sieve; sprinkle lightly with breadcrumbs to prevent sticking. Toss until pieces become round and form meatballs. Lightly coat the bottom of a large skillet with olive oil; set over medium-high heat. Working in batches, cook meatballs until browned and cooked through, 1 to 2 minutes. Transfer to a paper towel-lined baking sheet to drain. Repeat with additional oil and remaining meatballs. Spread 1 cup sauce on the bottom of a 13-by-9-inch baking dish. Layer pasta sheets over the sauce to cover the bottom of the baking dish. Top with with more sauce to cover the pasta; set aside. In a medium bowl, toss to combine meatballs with 1/3 cup pecorino Romano, and 1/4 cup basil; spread evenly in bottom of dish. Pour over 1 cup sauce, and layer with lasagna sheets to cover as needed. In the same bowl, toss sausages with 1/3 cup pecorino Romano. Spread evenly in baking dish over the lasagna sheets. Pour over 1 cup sauce, and layer with lasagna sheets to cover as needed. In a medium bowl, combine cubed mozzarella with 1/3 cup pecorino Romano. Spread evenly in baking dish over the lasagna sheets. Pour over 1 cup sauce, and layer with lasagna sheets to cover as needed. In a medium bowl, combine remaining 1/3 cup pecorino Romano with ricotta and egg. Spread evenly in baking dish over the lasagna sheets. Pour over 1 cup sauce, and layer with lasagna sheets to cover as needed. 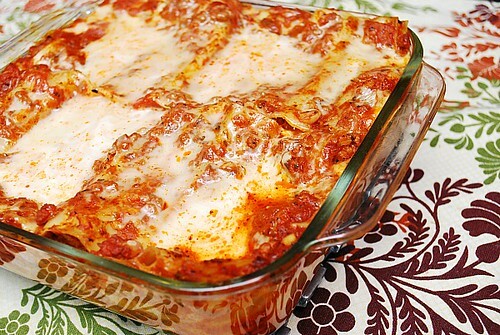 Cover lasagna with aluminum foil. Bake in the preheated oven for 1 hour. Remove from oven, remove the foil and sprinkle with shredded mozzarella cheese. Place back in the oven and bake for another 20-30 minutes until lasagna reaches an internal temperature of 160 degrees to 170 degrees on an instant-read thermometer. Remove from oven; let stand 15 minutes before serving. Garnish with remaining basil, and serve with remaining sauce, if desired. This looks HOLY incredible! I can't wait to make this and your Cheese straws! I love Lasagna, but have rarely made it. Maybe with your recipe I'll give it another try. Along with cooking I make handpainted Aprons. Aprons and cooking go together, right?